Today is the birthday (1486) of Arthur Tudor, Prince of Wales, Earl of Chester and Duke of Cornwall as the eldest son and heir apparent of Henry VII of England. Arthur was viewed by contemporaries as the great hope of the newly established House of Tudor. His mother, Elizabeth of York, was the daughter of Edward IV, and his birth cemented the union between the House of Tudor and the House of York. Plans for Arthur’s marriage began before his third birthday; he was installed as Prince of Wales two years later. He grew especially close to his siblings Margaret and Henry, Duke of York, with the latter of whom he shared some tutors. At the age of eleven, Arthur was formally betrothed to Catherine of Aragon, a daughter of the powerful Catholic monarchs in Spain, in an effort to forge an Anglo-Spanish alliance against France. Arthur was well educated and, contrary to modern belief, was in good health for the majority of his life. Soon after his marriage to Catherine in 1501, the couple took up residence at Ludlow Castle in Shropshire, where Arthur died six months later of an unknown ailment. Catherine would later firmly state that the marriage had not been consummated. 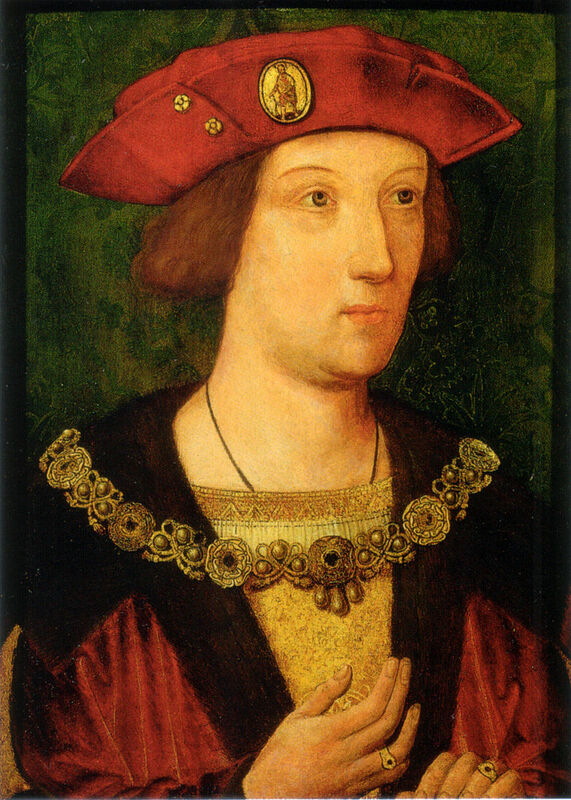 One year after Arthur’s death, Henry VII renewed his efforts of sealing a marital alliance with Spain by arranging for Catherine to marry Arthur’s younger brother, Henry, who had by then become Prince of Wales. Arthur’s untimely death paved the way for Henry’s accession as Henry VIII in 1509. The question of the consummation of Arthur and Catherine’s marriage cast doubt on the validity of Catherine’s union with Henry, eventually leading to the separation between the Church of England and the Roman Catholic Church. Arthur Tudor is not well known these days, and usually gets a brief mention only by way of “explaining” Henry’s marriage to Catherine, and the subsequent divorce leading to the break with Rome. But I find his life interesting in its own right, and helps us dig a little deeper into the relatively short but colorful Tudor era. By and large the Tudors tend to be simplistically stereotyped – Henry VII (“miserly and practical”), Henry VIII (“fat with 6 wives”), Edward VI (“sickly and young”), Mary (“bloody”), Elizabeth (“long-lived golden virgin”) – but because Arthur never made it to the throne he just gets forgotten. In 1485, Henry Tudor became King of England upon defeating Richard III at the Battle of Bosworth. In an effort to strengthen the Tudor claim to the throne and emphasize his family’s Welsh, that is to say Romano-British, ancestry, Henry had royal genealogists trace his lineage back to the ancient British rulers and decided on naming his firstborn son after the legendary King Arthur. 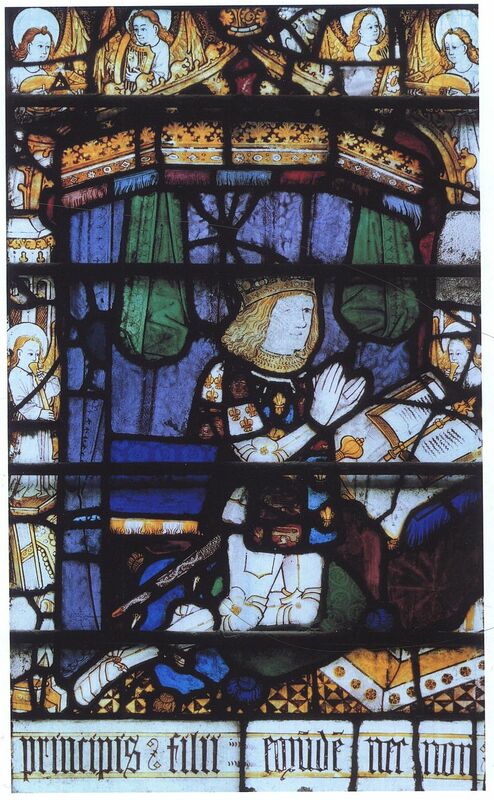 On this occasion, Camelot was identified as present-day Winchester, and his wife, Elizabeth of York, was sent to Saint Swithun’s Priory (today Winchester Cathedral Priory) in order to give birth there. Sir Francis Bacon wrote that although the Prince was born one month premature, he was “strong and able”. Young Arthur was viewed as “a living symbol” of not only the union between the House of Tudor and the House of York, but also of the end of the Wars of the Roses. In the opinion of contemporaries, Arthur was the great hope of the newly established House of Tudor. Arthur became Duke of Cornwall at birth. Four days after his birth, the baby was baptized at Winchester Cathedral by the Bishop of Worcester, John Alcock, and his baptism was immediately followed by his Confirmation. John de Vere, 13th Earl of Oxford, Thomas Stanley, 1st Earl of Derby, William FitzAlan, 16th Earl of Arundel, Queen Elizabeth Woodville and Cecily of York served as godparents; the latter two carrying the prince during the ceremony. 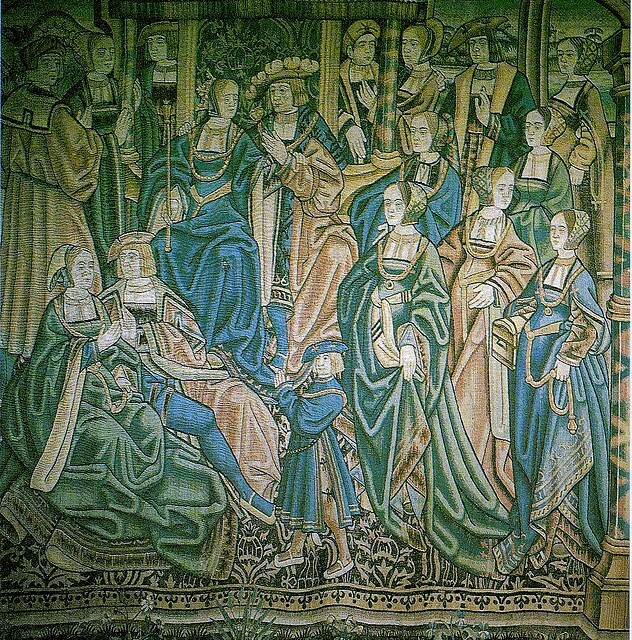 Initially, Arthur’s nursery in Farnham was headed by Elizabeth Darcy, who had served as chief nurse for Edward IV’s children, including Arthur’s own mother. After Arthur was created Prince of Wales in 1490, he was awarded his own household structure. Over the next thirteen years, Henry VII and Elizabeth would have six more children, of whom only three – Margaret, Henry and Mary – would reach adulthood. Arthur was especially close to his sister Margaret (b. 1489) and his brother Henry (b. 1491), with whom he shared a nursery. On 29 November 1489, after being made a Knight of the Bath, Arthur was appointed Prince of Wales and Earl of Chester, and was invested as such at the Palace of Westminster on 27 February 1490. As part of his investiture ceremony, he progressed down the River Thames in the royal barge and was met at Chelsea by the Lord Mayor of London, John Mathewe, and at Lambeth by Spanish ambassadors. On 8 May 1491, he was made a Knight of the Garter at Saint George’s Chapel at Windsor Palace. It was around this time that Arthur began his formal education under John Rede, a former headmaster of Winchester College. His education was subsequently taken over by Bernard André, a blind poet, and then by Thomas Linacre, formerly Henry VII’s physician. Arthur’s education covered grammar, poetry, rhetoric and ethics and focused on history. Arthur was a very skilled pupil and André wrote that the Prince of Wales had either memorized or read a selection of Homer, Virgil, Ovid, Terence, a good deal of Cicero and a wide span of historical works, including those of Thucydides, Caesar, Livy and Tacitus. Arthur was also a “superb archer”, and had learned to dance “right pleasant and honourably” by 1501. The now popular, and largely unchallenged, belief that Arthur was sickly during his lifetime stems from a Victorian misunderstanding of a letter from 1502. On the contrary, there are no reports of Arthur being ill during his lifetime. Arthur grew up to be unusually tall for his age, and was considered handsome by the Spanish court. He had reddish hair, small eyes, a high-bridged nose and resembled his brother Henry, who was said to be “extremely handsome” by contemporaries. In May 1490 Arthur was created warden of all the marches towards Scotland and the Earl of Surrey was appointed as the Prince’s deputy. From 1491, Arthur was named on peace commissions. In October 1492, when his father travelled to France, he was named Keeper of England and King’s Lieutenant. Following the example of Edward IV, Henry VII set up the Council of Wales and the Marches for Arthur in Wales, in order to enforce royal authority there. Although the council had already been set up in 1490, it was headed by Jasper Tudor, Duke of Bedford. Arthur was first dispatched to Wales in 1501, at the age of fifteen. In March 1493, Arthur was granted the power to appoint justices of oyer and terminer (fiscal power) who could inquire into franchises, thus strengthening the council’s authority. In November of that year, the Prince also received an extensive land grant in Wales, including the County of March. Arthur was served by sons of English, Irish and Welsh nobility, such as Gearoid Óg FitzGerald, 9th Earl of Kildare, who had been brought to the English court as a consequence of the involvement of his father, Gerald Fitzgerald, 8th Earl of Kildare, in the crowning of pretender Lambert Simnel in Ireland during Henry VII’s reign. Other servants were Anthony Willoughby, a son of Robert Willoughby, 1st Baron Willoughby de Broke, Robert Radcliffe, the heir of the 9th Baron FitzWalter, Maurice St John, a favorite nephew of Arthur’s grandmother Lady Margaret Beaufort, and Gruffydd ap Rhys ap Thomas, the son of powerful Welsh nobleman Thomas ap Rhys. 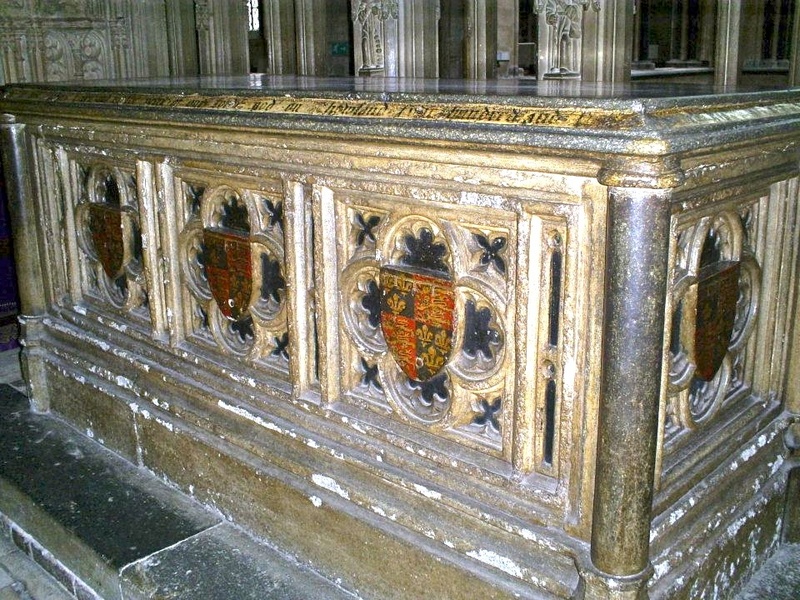 Gruffydd grew quite close to Arthur and was buried in Worcester Cathedral upon his death in 1521, alongside Arthur’s tomb. The young couple exchanged letters in Latin until 20 September 1501, when Arthur, having attained the age of 15, was deemed old enough to be married. Catherine landed in England about two weeks later, on 2 October 1501, at Plymouth. The next month, on 4 November 1501, the couple met each other for the first time at Dogmersfield in Hampshire. Arthur wrote to Catherine’s parents that he would be “a true and loving husband”; the couple soon discovered that they had mastered different pronunciations of Latin and so were unable to communicate orally. Five days later, on 9 November 1501, Catherine arrived in London. On 14 November 1501, the marriage ceremony finally took place at Saint Paul’s Cathedral; both Arthur and Catherine wore white satin. The ceremony was conducted by Henry Deane, Archbishop of Canterbury, who was assisted by William Warham, Bishop of London. Following the ceremony, Arthur and Catherine left the Cathedral and headed for Baynard’s Castle, where they were entertained by “the best voiced children of the King’s chapel, who sang right sweetly with quaint harmony”. What followed was a ceremonial laid down by Lady Margaret Beaufort: the bed was sprinkled with holy water, after which Catherine was led away from the wedding feast by her ladies-in-waiting. She was undressed, veiled and “reverently” laid in bed, while Arthur, “in his shirt, with a gown cast about him”, was escorted by his gentlemen into the bedchamber, while viols and tabors played. The Bishop of London blessed the bed and prayed for the marriage to be fruitful, after which the couple were left alone. After residing at Tickenhill Manor for a month, Arthur and Catherine left London and headed for the marches in Wales, where they established their household at Ludlow Castle. Arthur had been growing weaker since his wedding, and although Catherine was reluctant to follow him, she was ordered by Henry VII to join her husband. In March 1502, Arthur and Catherine were afflicted by an unknown illness, “a malign vapour which proceeded from the air”. While Catherine recovered, Arthur died on 2 April 1502 at Ludlow. 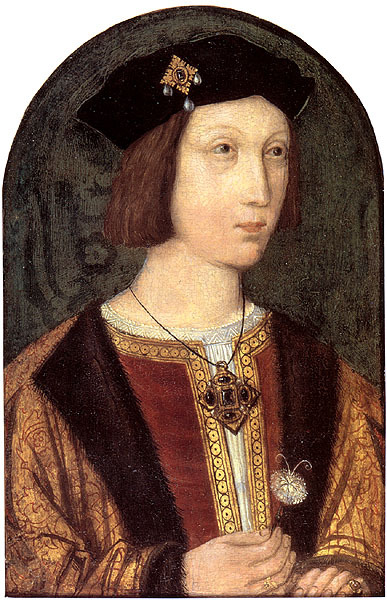 News of Arthur’s death reached Henry VII’s court late on 4 April. The King was awoken from his sleep by his confessor, who quoted Job by asking Henry “If we receive good things at the hands of God, why may we not endure evil things?” He then told the king that “[his] dearest son hath departed to God”, and Henry burst into tears. On 8 April, a general procession took place for the salvation of Arthur’s soul. That night, a dirge was sung in Saint Paul’s Cathedral and every parish church in London. On 23 April, Arthur’s body, which had previously been embalmed, sprinkled with holy water and sheltered with a canopy, was carried out of Ludlow Castle and into the Parish Church of Ludlow by various noblemen and gentlemen. On 25 April, Arthur’s body was taken to Worcester Cathedral via the River Severn, in a “special wagon upholstered in black and drawn by six horses, also caparisoned (draped) in black”. As was customary, Catherine did not attend the funeral.] The Earl of Surrey acted as chief mourner. At the end of the ceremony, Sir William Uvedale, Sir Richard Croft and Arthur’s household ushers broke their staves of office and threw them into the Prince’s grave. During the funeral, Arthur’s own arms were shown alongside those of Cadwaladr ap Gruffydd and Brutus of Troy. Two years later, a chantry was erected over Arthur’s grave. It is tempting to wonder what would have happened in England had Arthur lived and become king: no divorce, no Reformation, no brutal purges, no Elizabethan Age, no wars with Spain – England perhaps still a Catholic country. It’s hard to imagine. So much that has carried down to the present day, especially the Church of England, was formed in the Tudor era. From what little we know, Arthur was intelligent, kind and gentle. Maybe his would have been a tranquil reign. It’s idle speculation, of course. What happened, happened. Chykonys in bruette. Take an Sethe Chykonys, & smyte hem to gobettys; þan take Pepir, Gyngere, an Brede y-ground, & temper it vppe wyth þe self brothe, an with Ale; an coloure it with Safroun, an sethe an serue forth. Put a stewing hen (or hens for a big group) in a pot and cover with chicken broth or water. Bring to a slow simmer and poach for about 90 minutes. Remove from the broth and let cool a little. Then, using a sharp cleaver, chop the chicken into bite sized pieces, bones and all. You can, of course, strip the meat from the bones and then chop it – more suited to modern tastes. (In China, hacking into bony morsels is the norm.) Put the chicken bits into a pan with a little of the broth and flavor with freshly ground pepper and thinly sliced fresh ginger. Thicken with bread crumbs (or flour). Add ale and some strands of saffron and warm through gently until thick and smooth. 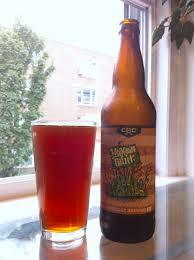 Choice of ale is a challenge but will make a big difference to the flavor of the sauce. 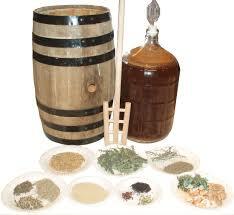 Historically ale was fermented without hops, and was made bitter with a blend of bitter herbs known as gruit. Gruit was a mix of herbs, commonly including sweet gale (Myrica gale), mugwort (Artemisia vulgaris), yarrow (Achillea millefolium), ground ivy (Glechoma hederacea), horehound (Marrubium vulgare), and heather (Calluna vulgaris). But gruit varied somewhat, each gruit producer including different herbs to produce unique flavors and effects. Other adjunct herbs included black henbane, juniper berries, ginger, caraway seed, aniseed, nutmeg, and cinnamon in variable proportions. Good luck finding ales without hops these days. Brewing your own allows you the opportunity to produce distinctive flavors. 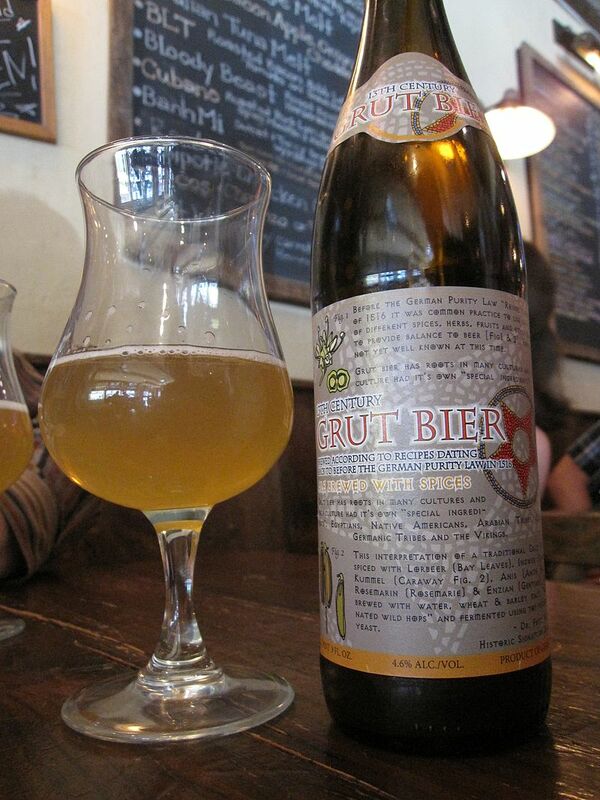 The 1990s microbrewery movement in the U.S. and Europe saw a renewed interest in unhopped beers and several have tried their hand at reviving ales brewed with gruits, or plants that once were used in it. Commercial examples include Fraoch (using heather flowers, sweet gale and ginger) and Alba (using pine twigs and spruce buds) from Williams Brothers in Scotland; Myrica (using sweet gale) from O’Hanlons in England; Gageleer (also using sweet gale) from Proefbrouwerij in Belgium; Cervoise from Lancelot in Brittany (using a gruit containing heather flowers, spices and some hops); Artemis from Moonlight Brewing Company in Santa Rosa, California (using mugwort and wild bergamot, Monarda fistulosa, also known as bee balm or horsemint); Alaskan Winter Ale from Alaskan Brewing Company, Anchor Brewing Company’s Our Special Ale, Haines Brewing Company’s Spruce Tip Ale, Kodiak Island Brewing Company’s Island Trails Spruce Tip Wheat Wine, and Baranof Island Brewing Company’s Sitka Spruce Tip Ale, (all southeast Alaskan companies, except Anchor) using young Sitka spruce tips; Bog Water from Beau’s All Natural Brewing Company in Vankleek Hill, Ontario, Canada (using Myrica gale, also known as bog myrtle), and Spring Fever Gruit from Salt Spring Island Brewery (made from organic barley, and containing some heather, among other spices). Brasserie Dupont in Wallonia, Belgium produces a gruit (Cervesia) for The Archeosite D’Aubechies an open-air museum that interprets life from the Iron Age to the Roman Era. 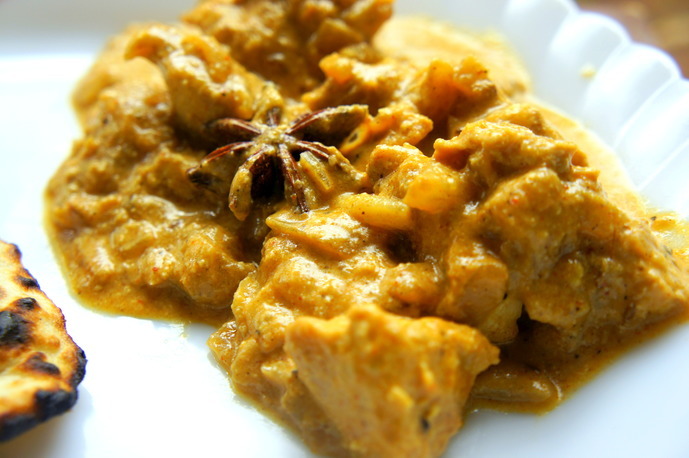 The recipe is based on archeological research. In the United States this beer is sold as Posca Rustica.